Actress Camille Prats’s son Nathan was launched as one of the new members of the children’s show Goin’ Bulilit during a press conference on Thursday, August 11. Talking to some members of the press after the event, Nathan said that he is 100% happy that he is now part of the Sunday program. Nathan said he really wants to become an actor so when his grandmother asked if he wanted to join Goin’ Bulilit, he said yes right away. Nonetheless, he will still continue his studies. He also expressed admiration for his mother Camille and uncle John Prats who were former child stars on the ‘90s children’s sitcom, Ang TV. “Sobrang galing po nila at proud po ako sa ninong (John) ko at sa mommy ko,” he said. He said that he is also very close to his mother’s fiancé, John Yambao. Nathan said is still calling John ‘tito’ but will call him ‘daddy’ once his mother gets married. Nathan also said that he misses his father Anthony Linsangan who died of cancer in 2011. Although he said he was only around three years old during that time, he still remembers their times together. “Lagi po kaming nag-mo-mall,” he recalled. 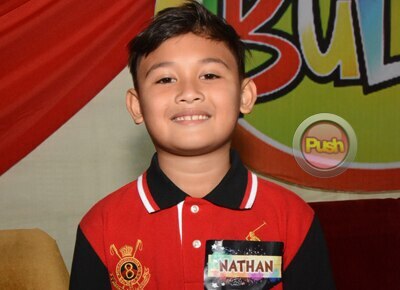 Aside from his mother and uncle John, Nathan said he idolizes FPJ’s Ang Probinsyano star Coco Martin.